This time of year is crazy busy for me, with so many commissions coming in and gifts to make. 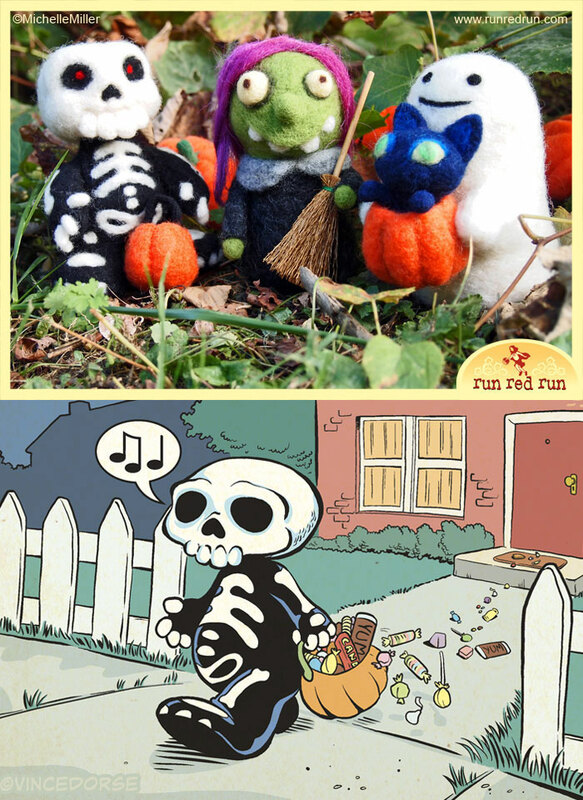 But I couldn’t let October slip by without celebrating Halloween with some felties. The Witch and The Ghost were last year’s sculpts. But that little Skeleton guy? He’s actually something I started a couple years ago and recently found in my great big box of unfinished projects. Based on a comic character designed by Vince Dorse, the little bag of bones is an honest-to-goodness monster who happens to enjoy Halloween just like a regular kid. I dug him out of his little cardboard coffin, cleaned up the fuzzy edges and got him ready for his big night. It was interesting working on him because I realized how differently I felted just a few years ago compared to my current process. He’s felted more firmly and, therefore, harder to make changes and alterations to. There are more shots in my gallery. And stop back in a couple days because I’m racing against the clock to get something special done for Halloween.